I've been missing in action for a couple of weeks, but I'm alive and well. I've just been real busy with school starting up again and preparing for my workshops and some other events coming up, like my Open House and 25 for $25 Card class. Just busy, busy, busy with my CTMH business, but just not the blogging end of it. Since the last time I posted, I was stunned, amazed, and honored to discover that one of my "CTMH Idols" (I hate that word...but you get the idea), Tresa Black, selected my layout as one of her favorites of her Inspirations Linky Party! I feel so bad, as I was supposed to link back to my blog, but at the time I couldn't post and I had intended to go back and get it done, but got side-tracked with all the busy-ness I mentioned above. If you've never been to Tresa's blog, YouTube Channel, or UStream Videos...you need to right that wrong, because you have been missing out! Even though the Linky Party is closed, I have included the list at the bottom of this post. So be sure to check out the incredible paper art! Now...on to one of my latest creations...my scrapbook layouts for next month's Scrap Club. 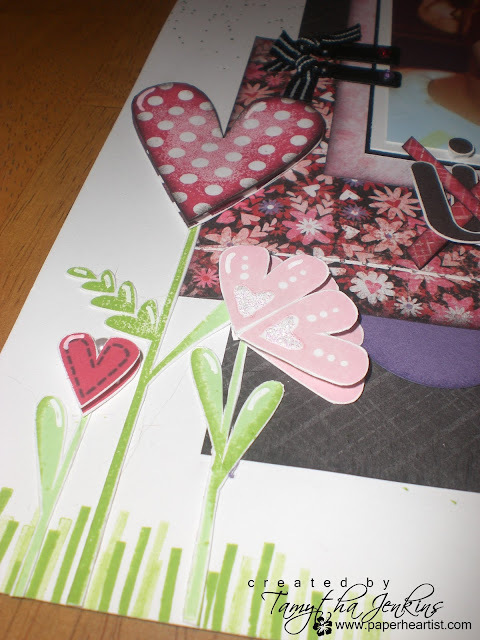 My next Scrap Club will be on Saturday, February 12th at 3 p.m. and we will be using the Sweetheart Workshop-on-the-Go. This layout is actually a sneak peak into what's coming February 1st! That's when Close To My Heart's latest Idea Book goes live. If you're able to, you are invited to attend my Sneak Peak Party on January 29th and receive your own copy for FREE! Be sure to check out the Schedule tab at the top of the page to find out more about these and other upcoming events. I actually stamped the sentiment twice, once with Tulip ink then with Black. I sprayed the white cardstock with undiluted black reinker. I used various techniques for the hearts, including first and second generation stamping, rock and roll, and sponging. I started out with the title, "I (heart) U", but since he put hearts all over himself, that it would be cute to cross-off the "i" and add "u" for "U (heart) U"...because after all, he hearted himself....get it? LOL You can also see the faux stitching here, as well, as creating a scalloped border using a circle punch. This is a new stamp set available in February. I inked in Key Lime and touched the edges to Pear. I also used a white gel pen to add some highlights. I used the bottom end of the stem to create the grass effect, cut the heart flower in half and used foam tape to adhere the two halves together to create a half flower, and (it's hard to see) added a gem to the center of the heart "tulip". The black embellishments are part of a new mini-medleys accent assortment and is available in this month's Inspirations brochure. I like the little extra touch the sparkles added, too. This bracket is an epoxy sticker that will be available for sale February 1st, separately or with the Sweetheart Workshop-on-the-Go kit. You can also see where I used the Stubble Tool with black re-inker to distress the edges of the black pattern paper. The second layout is almost ready to post, but I've got to enlarge one of my pictures still and finish the title, so I'll post it in a few days when I get it finished. 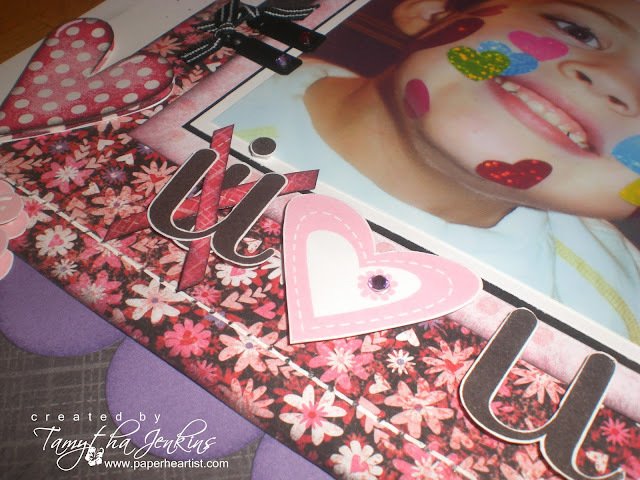 I totally love your two pager, loving your stamping and ink splattering! Thanks so much for playing along with Sketchy Thursdays GDT challenge! The Sneak Peek Party was a success!